I don’t usually book my hotels through online travel sites like Orbitz because you generally don’t get elite status or points. However, if the price is drastically cheaper, I’d rather save the cold hard cash than accrue the points – in most scenarios. Next week I’m staying at a Radisson Blu and since I’ve already banked the 50,000 point promo, I was only going to earn the base points of 30 Club Carlson points per dollar as a Gold Member (PS-If you haven’t done so, status match to Club Carlson by simply sending an email screenshot of any current hotel elite status: details here). Enter the promo code XLMBAM into the box at the bottom when making your reservation to have the 20% discount applied. 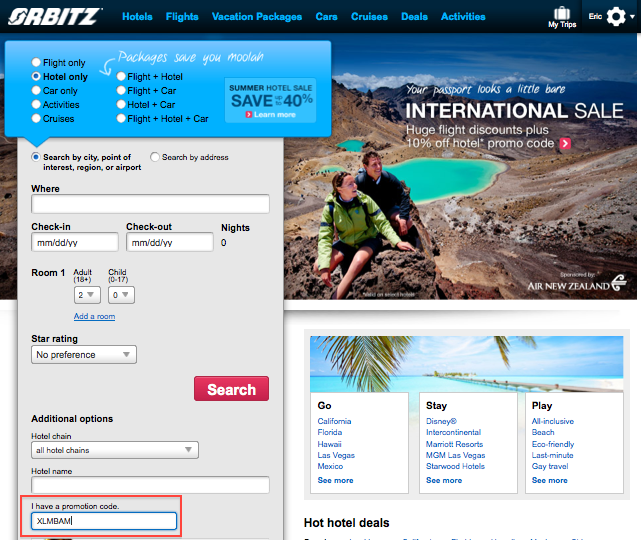 However, Orbitz is offering 20% off most hotel stays with promo code XLMBAM until September 10, 2012, as long as you book by August 13, 2012! No minimum and there aren’t many exclusions. I repriced my trip and actually found a lower rate and saved $78 using the code. Even though my stay won’t count towards elite status or earn me points, I still get double points for paying with my Sapphire Preferred and I have $78 more dollars to spend on my trip! Hat tip TPG reader Mark/ Best Rate Guarantee Blog!